Maybe my searching skills are wanting, as I'm sure this has been answered before, but can't find any post that does so. In the next couple of days I'll be installing the frets in the maple/rosewood Telecaster neck I'm working on, and the nut installation is next. My intent was to measure the string height at the nut from my Strat, and use that as the spec for the Tele. However, I'm thinking that future guitars I build might incorporate a zero-fret, and I got to thinking that the height of the crown of the fret wire I'm using would be consistent with use of a zero-fret, no? So that would suggest that this could also be used to determine how deeply I should cut the slots in the nut. Does this make sense, or is there something I'm missing here? A properly shaped nut should have these qualities, in my opinion. 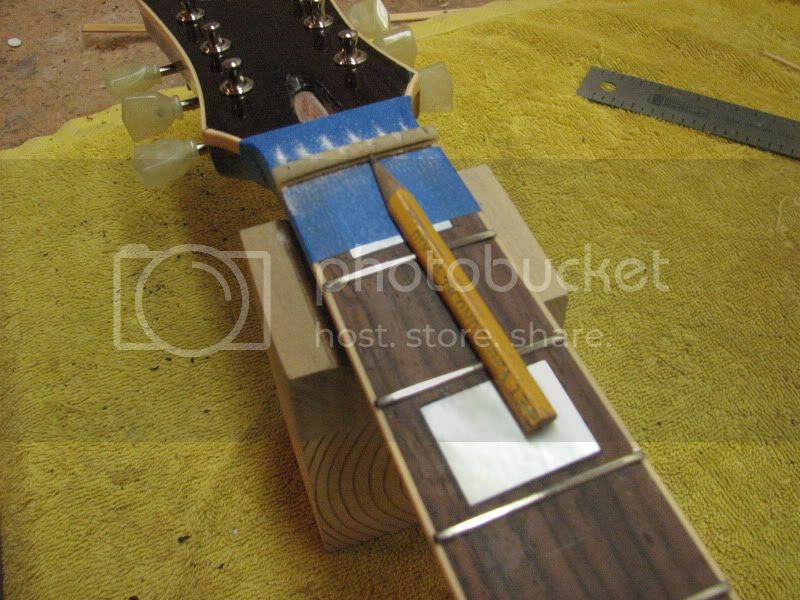 The fret board edge must be square where the string leaves the nut. Other than that, all edges should be smooth to the hand, and polished. The string slots should not be too deep. The top of the string for the lighter strings ( E to G) should be even with the top of the nut. The heavier strings should have approx. half of the string showing above the nut. This will prevent the slot from "choking" the string and stopping proper vibration. The nut slot should be rounded down on the headstock side to prevent the string from pinging while tuning. These are the measurements I use when I do set ups. They only differ if a player has a particular style that determines otherwise. All measurements are from the bottom of the string to the top of the fret. 3. String height at 12th fret, with capo on first fret. The rest should follow the curvature of the fret board, in between those measurements. My goal is to have the nut slot height about .005" taller than the height of the fret plane. I measure this by eye, by fretting the string at the third fret and looking at the height over the first fret. I've never considered Gordon's way since it includes neck relief and action height, which I consider separate issues, but you can definitely overcome those issues if you develop a method to do so. I call my method the "Frank Ford" method since he thought of it before I did. I find that if I make the nut slot height the same as the fret plane height I run into buzzing on heavy picked open strings, and the guitar is a lot more susceptible to humidity changes. I just replaced two nuts that I cut to the exact height of the fret plane - Did the setups in summer, by end of winter the guitars were unplayable. Gordon - thanks SO much for your specs. Those are going into my notebook for future reference. Question, though - what is your process? Do you cut the nut slots to an estimated depth, string and bring to pitch, measure the action, then loosen the strings and fine-tune the slot depth? Brian - thanks also for that wisdom. It would seem that those using a zero-fret would run into the issue you describe - unless the fret-leveling is done BEFORE installing the zero-fret. Would this likely add at least the .005" additional height you recommend in the process of leveling? String the guitar and tune to pitch. Press the string down between the 2nd and 3rd frets and check the gap between the first fret and the bottom of the string. Loosen the string enough to lift the string out of the nut slot and set it into another string slot temporarily while you take a few strokes with the nut file. 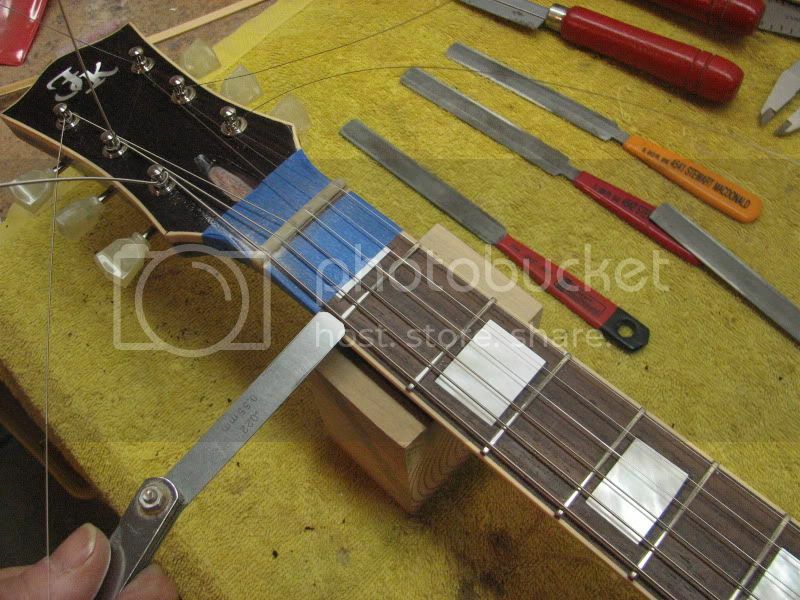 Then reset the string, tighten it up a bit (doesn't have to be to pitch) and re-check the gap. Don't file very much when you get close. It is real easy to go to far, which I guarantee will happen to you until you get the process down. By the way, make sure you file at a consistent angle that is somewhere between level and the plane of your peghead. Barry Daniels wrote: String the guitar and tune to pitch. Press the string down between the 2nd and 3rd frets and check the gap between the first fret and the bottom of the string. What gap do you shoot for in that process - zero? Steve, I start by marking a line with a pencil the I have sanded in half laying on the first two or three frets. Basically that establishes a "zero fret" line. I then file the slots approaching that line, both measuring with feeler gauges at the first fret and doing Barry's little test. My targets are similar to Gordon's, I like somewhere around 0.014 on the high E going up to about 0.018 on the low for most acoustic and electric guitars. This means that in Barry's test there will be a couple of thousands at one when fretted at 3 (I just want to make sure there is some clearance). Btw, I do a rough cut approaching the line with a razor saw but all the final work is done with the the guitar strung to tension - I loosen one string, move it out of the way, take a couple of swipes with the file, then tune it up and check the gap. I have heard of people stacking feeler gauges on the fretboard at the nut (the height of your frets) and simply filing down until the file touches the feeler but I've never been confident to do this. My targets are also similar to Gordon's but I do it all by eye. If you don't set the neck relief to near zero first, before you file final nut depth, you will invariably get fret noise on open strings when the weather changes. That's if you lower to near touching the first fret when fretted at the third. leaving a small margin makes sense but eventually you'll get a customer who demands the lowest possible action and they will hound you until you get it there. Going at it systematically will save you both time. David King wrote: If you don't set the neck relief to near zero first, before you file final nut depth, you will invariably get fret noise on open strings when the weather changes. Am I correct in assuming that the zero-relief is with the strings under tension tuned to pitch? Of course. String tension is a big part of the equation. String tension is what is balanced by the stiffness of the neck and the pull of the truss rod. Also you need perfect frets to approach zero relief. Many of us shoot for 2 or 4 thousands or so. Also remember that changing relief will affect action and to a small extent, nut action. That's why I always set it first and then don't mess with it unless it is absolutely necessary. Changing the action does not change the relief. Okay - to follow David's advice to be systematic, let me try to summarize what I've learned here as the process. Cut the slots to the depth defined in the previous step. Install the strings and tune them to pitch. Check the relief. Adjust the truss rod and re-tune to pitch until a zero-relief condition is achieved. Check the action at the 1st fret. When you "check action" at the first fret, you do it by pushing the string down between the 2nd and 3rd frets; whereas "checking the action" at the 12th fret involves no pushing of strings down. So I don't even call the first fret business checking action, but call it "checking nut slot depth". Kind of a terminology thing to keep the two separate but related and intertwined steps straight in my head. Push the string down between the 2nd and 3rd frets. Observe the height of the string above the first fret. There should be slight (about .005") clearance between the 1st fret and the string. Once you get all the nut slots where you want them, then loosen up and move all the strings out of the way, and file the top and rear edge of the nut to a final shape and height, and give it a nice polish job. You want the slot depth on the wound strings to be between 50% and 75% of the string diameter, and the unwound strings to be around 75% to 100% of string diameter, so not too deep. Some people flare out or fishtail the trailing edge of the nut slot. Let me know if it needs more edits! Steve, a couple of points. First, with every guitar I work on I first make sure that it is properly humidified and has no structural issues. That means that the neck angle is good. I also make sure the frets are perfect before I start. When I'm dealing with a customer who says they don't want to do fret work or set the neck or whatever I will still do a setup but I tell them it is a compromise. Next, I set the relief. If its a new neck or just refretted I set it to zero with no string tension, knowing that strings will pull a little in, but its better to set to your target with tension. Then I fit the nut blank, mark the "zero fret" line and the outside edges. Mark the two outside strings (different players like different spacing - usually between 0.110 and 0.125). Use that to mark the string spacing, score with the razor saw. File close to the line, string and tune up. Tight strings will hold the nut in place (you'll glue it later) while you file. At this point the saddle needs to be high enough to hold the strings off the frets - I'll just rough in a blank or do a quick adjustment. I mostly shoot for "first fret action" - the gap between the fret and the underside of the string (same definition as "12th fret action"). I have targets that work pretty well, you can find all sorts of specifications from just about every manufacture or technician. Measure a guitar that you like. For most electrics and finger style acoustics I shoot for 0.014 high E going up to 0.018 low E, but each time I file a little and tune the string back up I also do Barry's check - I want to see that little gap at the first fret. When I get close to the target (maybe a couple thou high) I do the saddle(s). I get them close (12th fret action), then check the intonation. After the action and intonation are where I want them I'll go back and finesse the nut. Then I loosen the strings, take the nut out and shape the top so the strings are somewhat exposed, polish it, make sure there are no sharp edges, replace it with two very small drops of CA. I usually put a new set of string on - all of this tightening and loosening is pretty hard on them. Remember that changing relief will change 12th fret action (and maybe slightly change nut action). Changing 12th fret action might have a very small effect on nut action, but will not change relief. Changing action will affect intonation. Also, your step 12 is wrong, the truss rod WILL change action but thats not what it is there for. Steve, I also found a thread on another forum where I actually make the nut - it is a long build thread but on page 16 here I do the nut (its the source of the pictures I posted above). Freeman Keller wrote: Also, your step 12 is wrong, the truss rod WILL change action but thats not what it is there for. I understand that, but what I was trying to say is that up to that point the action and/or relief will likely be incorrect, and that it will be necessary once the nut slots are done, to adjust the relief (truss rod) and 12th fret action (bridge), acknowledging that both require further adjustment. I can eliminate that step from the rubric as that is a separate issue from cutting the nut slots. Yeah, it's all related, and a change in one spec will affect the others.